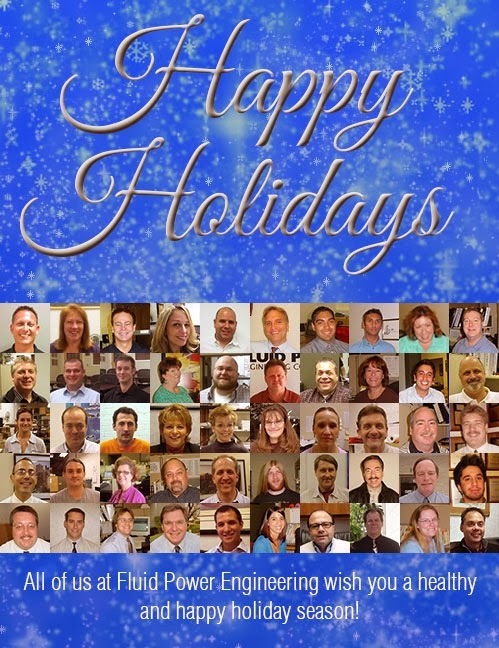 Wishing You the Happiest of Holiday Seasons! It's a pleasure working with each and every one of you all year long! Ah, your loyal distributor. You know us, we're there for you, backstage, making it happen so that your customers can be happy with you. I wanted to share another Fluid Power Engineering behind-the-scenes success story. 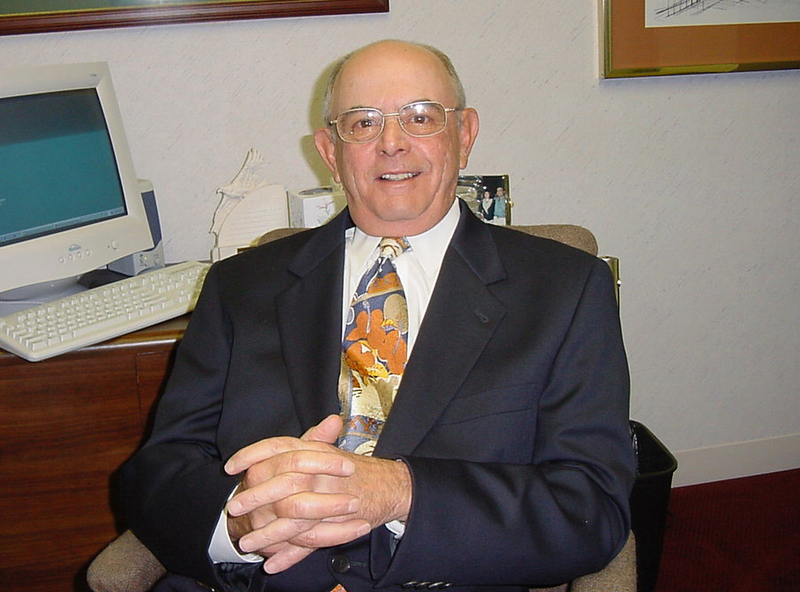 We are proud to call Altman Manufacturing a client. They were recently featured in Assembly Magazine for a vision project FPE and Teledyne Dalsa worked on with them. We're not mentioned in the article at all, but we don't mind. Really! That's what a distributor does, the assist. Still, we're very proud of our talented FPE Automation Controls Division team. They were responsible for making this successful project happen. Pivotal, in fact. You can check out the article here, or by clicking the image on the left. 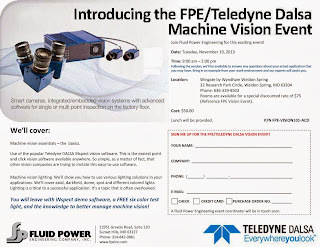 FPE is co-hosting a vision event with Teledyne Dalsa on November 19th in Weldon Spring, MO (greater St. Louis area). We'll be covering a lot of the same topics discussed in the article (vision, inSpect software, etc.) Plus, we'll host a special Q&A after the regular material is covered where you can bring your real life vision application in and discuss it with the experts. Space is limited, but still available at the time this blog post was published. Cick here for more information. An event co-sponsored by FPE & Teledyne Dalsa with content you can really use. You will leave with iNspect demo software, a FREE six color test light, and the knowledge to better manage machine vision. Oh, and lunch is on us! By the time we're midway through the session, we're pretty sure you'll be very satisfied with what you've heard. But if we do leave any questions unanswered, we're going to put you in the driver's seat. We’ll be setting aside time to answer any questions about the actual application that you may have. Bring in an example from your work environment and our experts will cover your topic. Cost: $50.00 Lunch will be provided. You can sign up by visiting the Fluid Power Engineering website, or by calling your FPE solution specialist: 847-364-7455. You'll be glad you joined us. The Modlink MSDD interface system makes it easy to access controls in the cabinet when the time comes for in-plant or machinery diagnostics and servicing. With Modlink the cabinet can remain closed and the components inside can continue to operate with their required level of protection. This helps you maintain compliance with all necessary safety regulations. Simply snap the appropriate GFCI circuit breaker into the frame. Then, if the switch trips, it can be reset without having to open the cabinet. Available in both a single and double frame size with a choice of cover (transparent, silver or fiberglass reinforced gray), Modlink MSDD is suitable for applications in a wide variety of environments. The covers come with a choice of locking mechanism, either a 3mm double-bit key or a knob. 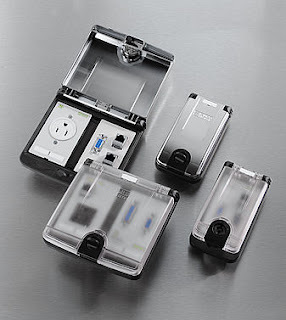 Both help the cover and frame meet IP65 requirements thus making the insert resistant to dirt, dust and humidity. The newly redesigned cover has a spring mechanism that lifts an open lid 30°. This allows you to see at a glance that it is open and reminds you to close it when finished. The modular system is based on a two parts: frames and inserts. With over 4000 combinations of frames and inserts, Modlink allows manufacturers to react to country specific requirements without having to rework the size of the housing each time. The cutout dimensions, which have remained the same even though the frame has a new look, are standard across the product line no matter which insert you choose for your application. This makes it easy for both designers and installers to work with Modlink MSDD. FPE has the Modlink tabletop demo in-house now! Interested in seeing it? Let us know. We'll bring it to you! 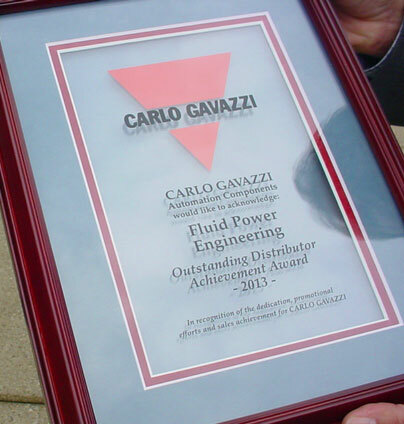 Fluid Power Engineering is pleased to announce the receipt of the Outstanding Distributor Achievement Award for 2013 from Carlo Gavazzi! 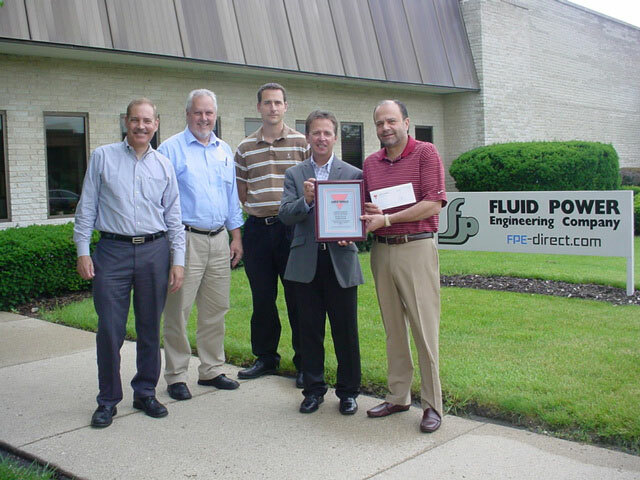 Left to Right: Mike Meurer from Innovonics, Fluid Power Engineering's Ed Hess and Scott Massie, Bob Sturkey from Carlo Gavazzi and Dave Bardos, President of Fluid Power Engineering. Fluid Power Engineering President David Bardos, Sales Manager Scott Massie and Automation Controls Division Manager Ed Hess were at FPE Elk Grove Village today to accept the award, along with a rebate check for "dedication, efforts and sales achievement". 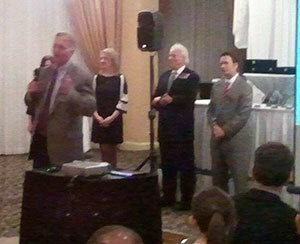 Mike Meurer from Innovonics and Bob Sturkey from Carlo Gavazzi presented the award. 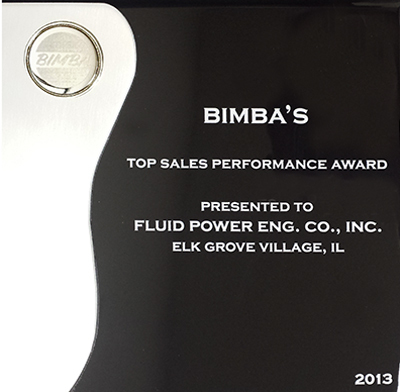 On behalf of FPE, we'd like to thank Mike, Bob and everyone at Carlo Gavazzi for this recognition. We would also like to thank Jomy Vadakumpadam and Tom Mathew in FPE's Automation Controls Division for their efforts so far this year. They worked closely with our Solution Specialists to make sure the products met our client's needs. And speaking of Solution Specialists, a well-deserved shout-out goes to Greg Bannister, Art Gesell and Ed Kowalski for exceptional Carlo Gavazzi sales so far this year. Without the effort of everyone involved, this Carlo Gavazzi sales success could not have been achieved. PHD's new angular pneumatic grippers received a product review from Design World Magazine Editorial Director Paul Heney. Check out the video! The Series GRV is a compact, rugged precision gripper available in four sizes that can support large moment capacities and long tooling lengths. The combination of design and features makes the GRV a superior choice for a wide variety of automation applications. A slim design allows ample space for "stacking" grippers in a confined area. 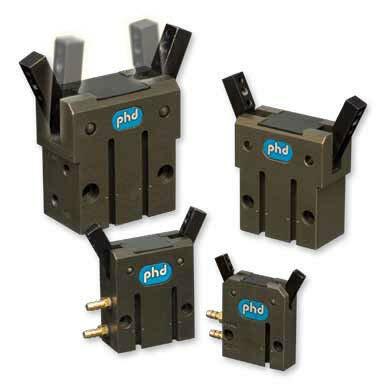 Today, we're looking at PHD Inc.'s new Series GRV Compact Precision Angular Pneumatic Gripper. If it looks somewhat familiar to you, that's because this product is modeled after the company's existing Series GRA Parallel Grippers. This gripper is, as the name implies, compact in size and precise, but it's also rugged. The GRV is offered in 4 different sizes, and it can support large moment capacities and long tooling lengths. The GRV can be used in a wide variety of automation applications. And the slim design allows plenty space if you want to stack several grippers in a confined area. This gripper's robust construction means you can expect a long operating life. You can see there are precision dowel pin holes here, that helps in accurate alignment of tooling and gripper mounting. Internal flow control is standard, which means that no external flow control is required. The units are supplied "switch-ready," for easy integration of optional magnetic position sensing switches. A teachable two-position switch allows multiple positions on small grippers within the profile of the gripper. There are cleanroom fluoro-elastomer seals and lube options, as well as manifold porting and multiple mounting locations. For more information on this new gripper including product animations and a catalog, you can visit the company's website, at www.phdinc.com/grv. 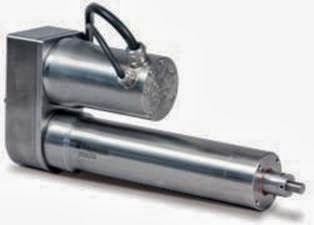 The Centaur series is a Round Line repairable cylinder designed to match tie-rod performance. The rugged design is ideal for transportation, clean room applications, packaging, or any application where tie-rods are not desirable due to cleanliness and/or envelop considerations. Teflon seals for reduced friction and low breakaway. Multiple mounting styles of front face flush mount, threaded rod guide, trunnion, and side mounts fit into a wide variety of application. Permanent lubrication for long maintenance free life. Standard bumpers reduce cylinder noise at end of stroke. Bore sizes range from 1-1/8" to 3". Downloading the Tolomatic iPad App just got easier. Now you can download it right from the Apple App Store. To download, just follow this link from your iPad: http://ow.ly/jYLzk or click the iPad App link under Quick Links on the home page of www.tolomatic.com. Already have the Tolomatic app installed on your iPad? We recommend deleting the version of the app you have and reinstalling the new version from the Apple App Store. To conform to Apple's space limitations for submitted applications, the new version includes limited content with the download and will sync all the files after the installation process. Depending on your connection, this will take a few minutes to complete. Omron offers state-of-the-art industrial automation products for wide range of industries. 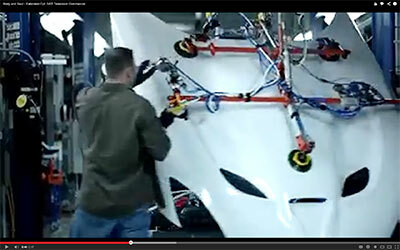 Check out this fascinating video that highlights winding and tension control. Impressive! 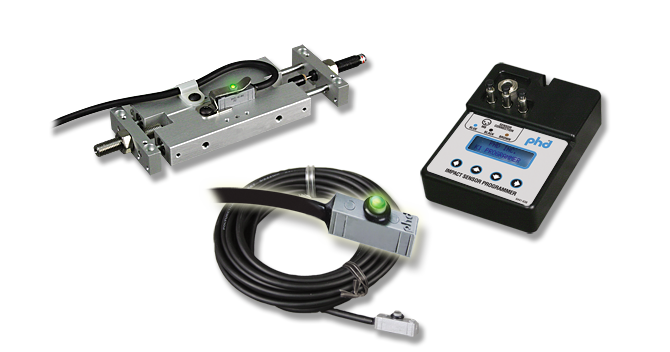 Visit FPE's website and click the Omron logo for more information about the NJ Series Controllers that Fluid Power Engineering is proud to offer. 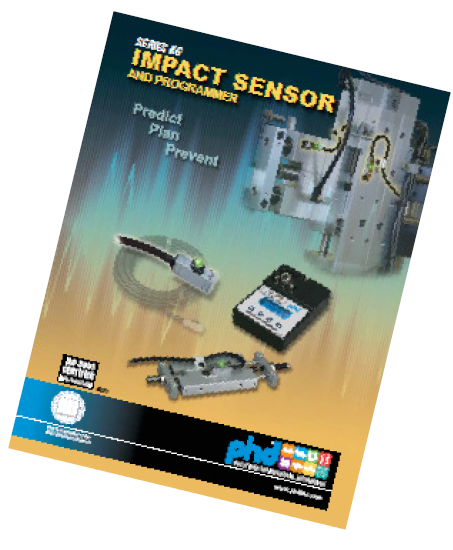 Introducing the PHD KG1 impact sensor & programmer. The KG1 easily attaches to any moving mass or machine with a bracket. It monitors the impact of moving mass force at the moment of stopping and compares measured impact of internal set points assigned by you. Early client reactions to this new product by PHD have been very positive. If you'd like to check it out, just say the word and we'll stop by with a demo case. Following the session, we’ll be available to answer any questions about your actual application that you may have. Bring in an example from your work environment and our experts will be there to assist you.